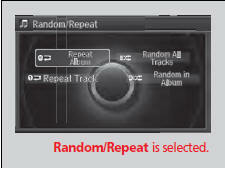 You can select scan, repeat, and random modes when playing a track. 2. Rotate to select Scan or Random/ Repeat, then press 3. Rotate to select a mode, then press . Scan Albums: Provides 10-second sampling of the first track in each album. Scan Tracks: Provides 10-second sampling of all tracks on HDD. The following menu items vary depending on the category you selected by the Music Search list. Repeat Artist: Repeats all tracks in the current artist. Repeat Album: Repeats all tracks in the current album. Repeat Track: Repeats the current track. 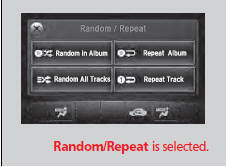 Random in Artist: Plays all tracks in the current artist in random order. Random in Album: Plays all tracks in the current album in random order. Random All Tracks: Plays all tracks in random order.